One spring morning in 1971, my teacher, Chögyam Trungpa Rinpoche, taught me how to teach meditation. We were outside the house my wife and I shared with Rinpoche and his wife in Fourmile Canyon in Boulder, Colorado. We sat facing each other across a picnic table in the bright April sunlight. What he told me had nothing to do with the technique of sitting meditation, which usually involves working with the breath as an object of meditation and dealing with the mental events that lead us away from the present moment. Rather, his instruction was about how to be an ordinary human being in relationship with other ordinary human beings. It was about honesty and intimacy, and it was a description of his relationship with me. He said that the teacher sits across from the student and shows the student his openness. The teacher lets the student know that he is hiding nothing and that he does not judge the student, understands and listens to the student, is there as the student’s friend. He said that the teacher opens to the student—a bit. This encourages the student to open to the teacher. When we are in the presence of someone who sees us accurately, without personal bias, and still accepts us non-judgmentally, we relax. We like the person and we are warmed by his or her uncritical affection. In the face of unqualified acceptance, we can drop our protective armor and show our hidden fears, our inner shames, our uncertainties. This is something we all yearn to do—drop our self-protective masks and armor, exposing the “real me”—because so long as we feel we are not truly seen, we cannot feel we are truly loved. Trungpa Rinpoche called such opening on the student’s part “giving the teacher the gift of ego,” because the student is giving up the self-protective mechanisms that constitute ego. It is a process that requires one to suspend self-doubt and to trust in the other person, and it results in intimacy, friendship, and love. The teacher, seeing the student open a bit, in return displays more openness in order to encourage the student, who—further warmed and delighted—can open a bit more, and so on, back and forth. But the teacher cannot open too much or too fast, because then he might become a demon for the student and frighten the student away, which would defeat the purpose. Rinpoche likened the process to negotiation between diplomats, to dancing, to making love. And he said that this is the main job, the most important part of being a guru and, for the student, a fundamental aspect of the Buddhist path. I came to realize that Trungpa Rinpoche was inviting all his students to communicate in this way. Following his death, some of us began looking for methods to recreate the openness and compassion we experienced with him and discovered Modern Psychoanalytic Group Therapy. We are working to bring it into the Buddhist path, because it offers the kind of insight, freedom, and intensely intimate interpersonal communication he inspired. Frank is a recovering alcoholic and drug addict. He attends Alcoholics Anonymous, is committed to the Twelve Steps, and two years ago joined a Buddhist center, where he has embraced meditation and a community of fellow practitioners. His involvement at the center has, by his own testimony, brought new support to his life. The victim of a traumatic, abusive childhood, he holds his body stiffly, his face expressionless as he speaks. Forty-five years old, heterosexual, he has been out of relationship since joining Alcoholics Anonymous and, despite his membership in AA and at the center, his life lacks intimacy. He is lonely and sexually frustrated. To deal with this alienation and detachment, he has joined our psychotherapy group. Helen is an aspiring singer, forty years old, living in a failed relationship with a man who is verbally and emotionally abusive to her but who supports her financially while she dreams and hopes for a better life in Florida. He recently had an affair with another woman, but stays in relationship with Helen, and she with him, out of convenience. Intelligent, outgoing, physically attractive, she is emotionally volatile, easily hurt, and expressive with her face and body when excited, which is often. She too comes from a traumatic childhood: an angry, abusive father and an unavailable mother. She is easily provoked to anger by male authority figures, and she brooks no criticism of her risky lifestyle. She takes menial temporary jobs, working for low wages while she seeks opportunities to perform, which seldom materialize. 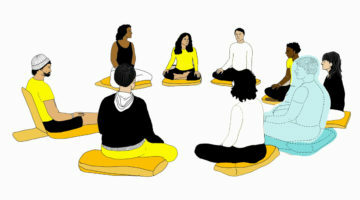 Frank and Helen are sitting next to each other this evening in a nine-member psychotherapy group, most of whose members come from a local Buddhist meditation center. The group is led by me and my wife, Natalie, in New York City. Frank has been silent since the beginning of the session, for almost an hour, but this is not unusual for him. With thirty minutes to go, another group member addresses him, asking if he is all right remaining quiet or if he would appreciate being drawn out. Frank replies that he has something he would like to discuss. In his life outside the group he is encountering a difficult situation. He has met someone at AA and is falling in love with this person, a “newbie” to AA, and he knows better. By AA rules and guidelines, both of them are early in the recovery process and are advised not to enter into relationship with anyone, much less another new AA member. But Frank is lonely, has been single for two years, and he yearns for someone to love and be loved by. The two went to the movies together, held hands, kissed. But now she tells him she wants only to be friends, that she is determined to make her sobriety work, and that they ought not to develop their budding relationship. She is more determined than he to resist. Frank feels terribly sad but says he knows he too must draw boundaries. And even if he doesn’t, she will. The other members of the group are startled by Frank’s candor and moved by his sorrow. Natalie, suspecting that Helen understands Frank, asks her what she feels as she listens to his story. Helen turns in her chair and addresses Frank. Speaking with sympathy and affection, she tells him that she feels touched and saddened by his story, that it resonates with her own unfolding story. A few weeks ago she reported that she had met someone new, that she cared for this new man, and that she had learned he has cancer. Now she tells the group that the doctors say his cancer is incurable. She is crying, because he is pushing her away and has become abusive as she persists in her efforts to maintain the relationship. The group is dismayed at her bad luck and amazed and shocked at her willingness to pursue a new relationship while living with another man, even though their arrangement appears destined to end soon. There are many such encounters in our group, though they can also involve expressions of negative emotions—anger, hurt, jealousy, irritation—as well as positive ones, and such communications can be just as powerful as the one described above. In each case, we are following the methodology of Modern Psychoanalytic Group Therapy as it has been elaborated, taught, and practiced over the last forty years by the New York psychoanalyst Dr. Louis R. Ormont. 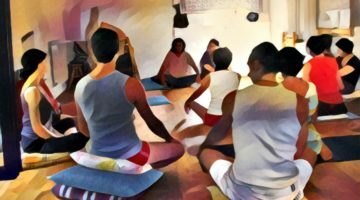 This form of group therapy is a method for training people to be aware of their emotions and to use them to communicate skillfully, with heart and intimacy. It is a set of techniques designed to help people see, understand, and drop their masks, their habitual patterns, their armor. It is a way to “give the gift of ego.” Those of us inspired by Modern Group have been working to describe it in Buddhist terms, in order to make it more congruent with Buddhism and available to Buddhist communities. I first met Lou Ormont in the summer of 1974 at the inaugural session of The Naropa Institute. I was the Institute’s CEO then, and I was also teaching a course in Tibetan Buddhism. One day after my lecture a man approached me, speaking excitedly: “This Buddhism, it’s …psychoanalysis!” He went on to explain animatedly a bit about his background, and I appreciated his enthusiasm, even though I knew nothing about Western psychology. Lou was prominent in his field and was unusual among psychoanalysts, in that he only did group treatment. He came out of the Modern Psychoanalytic tradition founded in the 1950’s by Dr. Hyman Spotnitz, a psychiatrist known for his curmudgeonly brilliance who did a lot of work with schizophrenics. Lou had been teaching at Columbia and Adelphi universities and had a busy practice in Manhattan. That summer he and his wife, Joan, had decided to explore a new approach to human potentiation and came to Naropa, where Buddhism and the practice of meditation so inspired them that in succeeding years Buddhism strongly colored the development of what has become the Ormont Method of group psychotherapy. Lou and Joan impressed the Naropa faculty, and the following summers they returned to teach in Naropa’s nascent psychology program. Their influence endures today in Naropa’s Contemplative Psychology program, where the Ormont Method is still taught. Modern Analytic Group Therapy practice stresses “immediacy,” which corresponds to the Buddhist idea of “nowness.” Just as in sitting meditation we drift into dreaming from time to time and lose awareness of the present moment, so in group we can get lost in telling stories of the past or future, in discussing problems from times other than the present, and in trying to get other group members to do or be what we want. And just as in meditation the practitioner can awaken from dreaming and come back to the object of awareness in the present, so in group members are enjoined to put into words their thoughts and feelings toward the other group members as they arise in the present moment. Staying in the present with others in this way can be difficult: it exposes our inner thoughts and feelings and can be revealing and embarrassing. It does not confirm our versions of who we are, the way discussion of the past and future does. So group members tend to fall away from addressing each other intimately, from revealing their inner thoughts and feelings about each other. They slip into storytelling about events, problems, successes, regrets, worries, hopes and fears outside the present moment, or they try to change each other’s behavior to make it more congenial to themselves. Mental health care practitioners call the ways we avoid the present “resistances.” Buddhists refer to them as “habitual patterns.” Hyman Spotnitz called them “mistakes in time,” signifying that we apply a lesson—appropriate behavior learned in the past—inappropriately in the present. As we live them out again and again, they deaden us to the power and intimacy of the present moment. Trungpa Rinpoche taught that we have not “met our emotions properly” because our habitual patterns insulate us from them. He said that, instead, we are continually either “repressing or acting out our emotions,” and that both are ways of getting rid of them and resisting the often uncomfortable reality of the living moment. In a similar vein, Lou calls the work of group “emotional education.” The idea is, first, to be aware of one’s emotions (not an easy task), and then to put them into words instead of denying or acting on them. One of Lou’s slogans is, “Observe it; don’t fix it,” an instruction appropriate to meditation practice as well as group psychotherapy. 1. To express one’s thoughts and feelings toward the other group members as those thoughts and feelings arise in the present moment. 2. If one is unable to do this (or to fulfill any other part of the contract), to discuss with the group why not. 3. Attacking is not allowed. For example, an appropriate expression of feeling might start with a description of it and why one has it: “I feel…because…” An attack might start with, “You are a…” and will cause people to react with fear, anger, or guilt, stopping communication, which defeats the purpose. When an individual attacks, or in any other way seeks to influence or alter another’s behavior, the attacker loses awareness of what they are feeling and doing. 4. To tell the emotionally significant story of one’s life (not an autobiography, but historical information appropriate to the moment, explaining why one acts and reacts the way one does). 5. To take a roughly equal part of the talking time and to help others do the same. 6. To understand the other group members and put that understanding into words. 7. To put everything into words rather than physical action. It is each member’s response to these points of “contract,” and other less significant points revealed in the course of time in group, that constitute and reveal the member’s resistances or habitual patterns. Even compliance can be resistance to openness in the present moment, as when, for instance, a member wants, for various reasons, to be “good.” Deviating from the contract does not make one bad; it is an occasion for study: “Observe it; don’t fix it.” It is the Modern Group analog to the Buddhist idea that enlightenment or nirvana lies in the accurate perception of confusion and suffering. Most of us are aware only of our more obvious resistances or habitual patterns. Many are so ingrained, so taken for granted, that we live them out unconsciously. We cannot see them, just as we cannot see our own eyes, unless we look in the mirror. It is the group’s job to act as mirror, just as it is the guru’s, in order to help us identify and master our resistances so that we can live more intelligently, freely, and openly. When group members express their honest thoughts and feelings about one another (without judgment or attack), the group helps them to awaken from their states of unknowing, their protective ignorance. 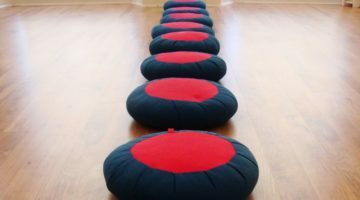 To facilitate this process, the Modern Group helps its members develop their “observing egos,” which corresponds to the Buddhist idea of prajna, often translated as wisdom or insight. In the notion of observing egos, the term “ego” is not used in the Buddhist pejorative sense of mistaken belief in the self. Rather, it signifies a basic sense of being that is present in the moment and is capable of creative choices and action. Lou Ormont defines “observing ego” as that faculty of mind that is not fooled, a quiet intelligence that knows without any motion or action and sees things as they are. It is that faculty of mind, for instance, that sees how a certain person professing affection for you is actually trying to manipulate you. You might focus on this awareness or you might not, but it is always there, effortlessly, accurately, at least in the background. Usually we are so caught up in our beliefs about ourselves and the world that we are largely unaware of our observing ego, our prajna. We operate on auto-pilot, lost in reflection. But when we begin to reveal the workings of our minds to others, as we do within the group process, then we can receive feedback that points out to us when our thoughts and feelings are distorted, allowing our observing ego to come into play. A group member, Thomas, has a domineering mother, whom he fled as a young man; he left England and came to the U.S. at least in part to escape her. She had constantly belittled him as he was growing up—his achievements were never enough for her and she was contemptuous of his masculinity—and now he distrusts women profoundly. He feels they harbor a secret contempt for men in general and him in particular, so when Susan, listening to his story of childhood suffering, tells him that she feels deep sorrow and sympathy for him and anger toward his mother, he does not believe her. The group is stunned, witnessing him read her heartfelt expression of affection and understanding as “condescension.” They tell him so, but he is powerfully invested in the lessons of his past and for many months does not believe them. Eventually, encountering the group’s “observing ego” repeatedly, he begins to doubt that all women share his mother’s outlook, begins to see his fears and preconceptions for what they are, and opens to the possibility of female warmth, approval, and affection. He begins to understand the web in which he has been caught and how it functions, and his world changes profoundly. When group members express their minds in this way, the communication is charged with power, genuineness, and intimacy. Such expressions require risk: one never knows how one will be received when revealing aspects of one’s mind previously thought unfit for communication. Trungpa Rinpoche called such risk-taking “taking a leap,” and encouraged his students to “just do it!” long before Nike developed the slogan. Lou Ormont enjoins his group members to “go toward the sound of the cannon,” an eighteenth-century instruction to soldiers lost in the smoke and confusion of battle. This is not to say that we are meant to expose in a deliberate manner those aspects of our psyches we find most embarrassing or shameful. The power of the group process does not lie in confession, which is a one-way performance requiring an audience. Rather, group is about give and take, dialogue. Members risk saying what they usually hide from one another, expressing what they feel toward one another, and they are appreciated. Such communication drops walls and fosters connection. When it occurs, this kind of risk-taking produces what in Modern Group is called “progressive emotional communication,” a polysyllabic phrase for what Buddhists would call upaya, the union of prajna and compassion. It occurs as one group member tells another his or her feelings for the other, and the second person, moved, responds in kind. The communication moves forward as the two or three or four reveal their feelings to each other and why they have them. It is “progressive” because it contains new information about what is actually happening now. It is “emotional” because it is primarily about feelings, not ideas or judgments, and it contains a great deal of energy. And it is “communication” because the communicants are addressing each other openly, without subterfuge or agenda, and they feel seen and heard. As Lou says, it is the essence of true art and successful love affairs and marriages. In whatever ways we come to this kind of communication, it awakens us and makes our lives worth living. Without it we live like zombies, encased in the webs we weave of habitual patterns, hopes, and fears that isolate us from the brilliance and vividness of the world. On April 20, 1999, two teenage boys armed with guns and explosives entered Columbine High School in Littleton, Colorado, and in less than thirty minutes killed twelve fellow students and one faculty member and injured another twenty-four, before taking their own lives. We all know this horrible story. I have thought about these two boys who were so isolated from their peers, plotting alone in a garage, who were so full of hurt and rage and delusional fantasy, and I have wondered what might have happened if they had been able to tell their fellow students of their feelings toward them. I like to think that, if such a thing could have happened, it might have defused their fury; created links of communication, intimacy, and understanding; and prevented the tragedy. This kind of tragedy breeds in the absence of progressive emotional communication and it can only occur in a vacuum of intimacy. If we are to mitigate the aggression that threatens to utterly overtake us all, it can only be by means of intimate communication, however we can make it happen. John Baker is a student of the late Chögyam Trungpa Rinpoche and was a co-founder and the first CEO of Naropa University. He co-edited Trungpa Rinpoche’s books Cutting Through Spiritual Materialism and The Myth of Freedom. Retired after twenty-three years in business, he teaches Buddhism and leads psychotherapy groups in New York City.